classic tea cakes, two ways. christmas time is just not complete without these cookies. if you feel you don't have time to bake cookies, these are super easy, simple & delicious, and feel just like christmas to me. i made this batch two ways. half are plain tea cakes and the other half have mini chocolate chips added. i grew up on the plain tea cakes during the holidays, so as much as i do love me some chocolate chips, i'm a bit of a purist with these little cakes. the plain & simple cakes are such a nostalgic treat for me that i always only have around christmas time. the chocolate chippers are like a completely different cookie in my mind. somehow that makes sense to me. maybe i'm just a kooky cookie lady. 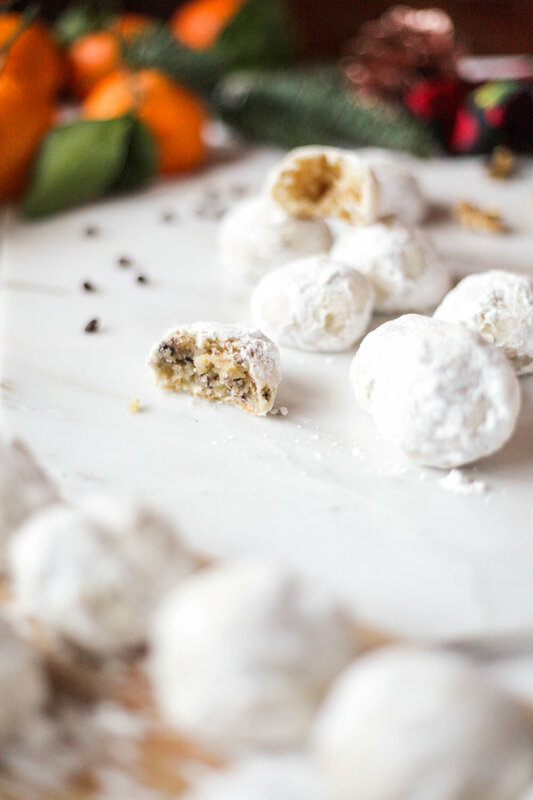 my family always called these cookies "butter balls," which does not sound very glamorous or sophisticated, but is exactly what they are...balls of butter. i think they have a zillion names like russian tea cakes or mexican wedding cakes. i guess calling it a "tea cake" makes you feel like a little less of a santyclaus glutton than calling it a "butter ball." make sure to cool the cookies all the way through after baking or the powdered sugar gets all sticky. i set mine outside for a little bit so they'd cool faster...but was eXtReMeLy paranoid that a squirrel or crow were going to divebomb down and gobble em up. that was a very stressful 5 minutes. but quite the timesaver! buttery soft melty pillows of crisp & fresh simple coooookie gooodnessssssss. also, i am a walnut lover. i know lots of people are haters, so leave em out if you dislike. i just think they make these cookies worth whiiiiile. and add chocolate chips to half of the dough, if you like. because variety packs make life worth livin'. Preheat oven to 350 degrees F. In a stand mixer or large mixing bowl, cream the butter well. Slowly add flour and mix on medium high between additions until a dough forms. Add the extracts, salt, 3 TB. powdered sugar, and milk. Mix until ingredients are just combined. Add the chopped walnuts and mix again. If desired, scoop half of the dough into a separate bowl. Add chocolate chips to the dough in the original mixing bowl and stir just until combined. The second bowl will be for plain tea cakes. Roll the dough into small balls (smaller than a golf ball). You want to roll them tightly so they do not crumble after baking. 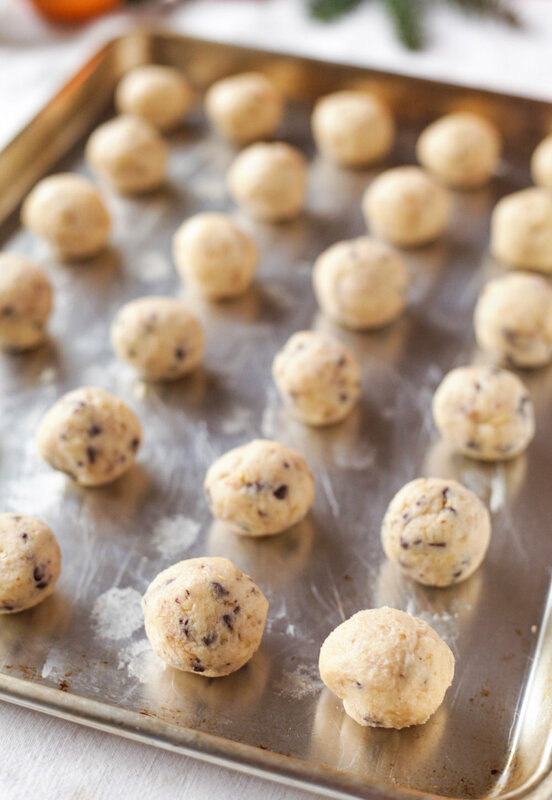 Place cookie dough balls on a baking sheet. Bake for 13 minutes at 350 degrees F. Remove from oven and let the cookies cool completely (I set mine outside for about 5 minutes to speed up the cooling process). You want them to be all the way cool before rolling them in powdered sugar or it will melt and be sticky. 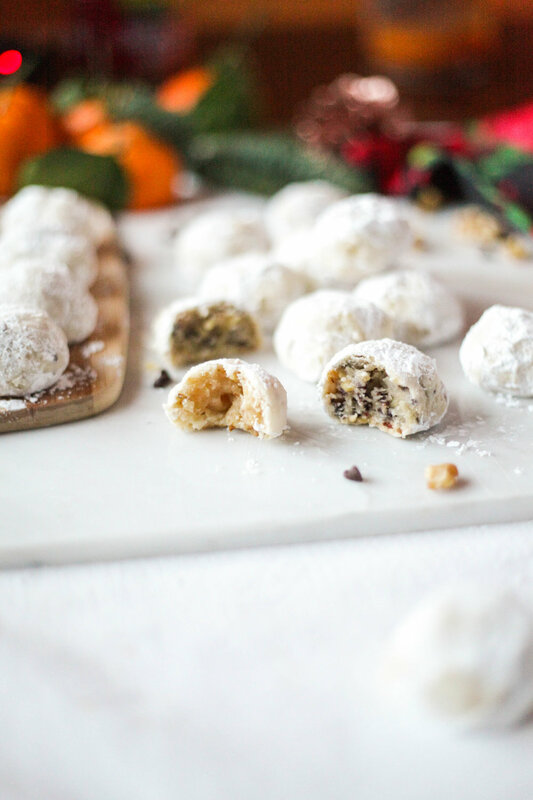 After the cookies are cool, roll each cookie in powdered sugar until it is coated. You can also add the powdered sugar to a small paper lunch bag and shake the cookies individually in the bag until coated. ho ho ho eat that butter ball, yo.